We all know about the Prides in Tel Aviv, Copenhagen, New York, Mexico, Sao Paolo, Tokyo and Amsterdam. We also know that, with hundreds of thousands, sometimes even more than a million visitors, they are among the most popular prides in the world. Less attention has been paid to the prides in smaller places with only a small number of visitors varying from a couple of thousands to only a handful. With PrideRadar, InterPride, the international federation of pride organizers, has been able to identify more than 1100 pride events around the globe. On almost a daily basis new prides have been identified. Prides have been identified in Europe, North America and South America, but also in Africa, the Middle East, the Pacific and Asia. Although the pride movement can be seen as one of the biggest movements around the globe, its impact on world politics is limited. For the SOGIE-community this is a missed opportunity that we cannot afford. Generally speaking, the SOGIE-movement is supported by advocacy organizations. They battle, petition and lobby to change laws and improve the social climate. The pride movement on the other hand is too often still seen as a scene of partygoers that celebrate and showcase extravaganza as if there is nothing left to fight for. This stereotypical image misrepresents the role pride plays in the lives of many of our community members and the impact pride can have on societies around the world. Although the legal, social and cultural context of pride differs from country to country, they all have in common that pride is about taking the public space. What is visible cannot be ignored and has to be dealt with. With millions and millions on the streets all around the world throughout the year the pride movement is a powerhouse that can push for change. But where the advocacy movement in international institutions and forums is doing its job, the pride movement is still clearly absent. This is a situation that has to change. First of all because it is just not right to let the advocacy movement do all the difficult groundwork. Although one can say that each has a role to play in society, the support of the pride movement in changing laws and improving social climates, is key for further success. High Profile Politics was a new strategy designed and implemented by Frank for the Dutch LGBTI-movement. He has since incorporate it during his workshops for InterPride. 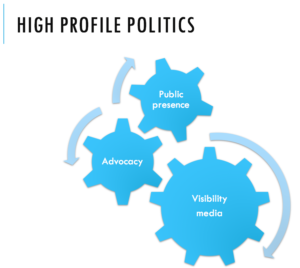 The Dutch political scientist Ronald Holzacker found that under the right circumstances, the most successful LGBTI-strategy aiming at creating change, is the strategy where advocacy, media-visibility and events with high number of participation are intertwined. This is what he calls “high profile politics”. This should be an inspiration for the global pride movement. Using the existing visibility and high numbers of participation in the right way, can stimulate further legal and social change that will benefit our community. But in order to become a valuable force with global impact, the pride movement has to develop itself further. The objectives of different prides are not the same. There are prides just celebrating diversity, there are prides who do not seek visibility and are being organized to empower their own community in the shadow of the often state-sponsored homophobia. There exist prides that service the pink dollar by attracting the pink tourist and there are prides, which are just out there to turn the event into a commercial success. Nevertheless, the vast majority of prides create hybrid models where celebration collides with manifestation. Where, while walking the streets, the participants with countless messages meet the even so countless number of spectators. Whether it is the supporter along the route or the individual with a more critical attitude at home while reading the papers and watching the news. These are the prides that make the change on local and national level and could be made more successfully on an international level. The international advocacy movement is well organized, but the international pride movement is still struggling to move forward. In Europe, Canada and some parts of the USA we see established pride platforms. They work together within the international pride organization InterPride. Unfortunately, with almost no members outside of North America and Europe it is hard for InterPride to claim the full international role that is needed to bring change. Nevertheless times are changing. The increasing awareness of pride around the globe and the mindset that collaboration and international support can change the lives of many in our community is creating a possibility to start moving into the direction of a truly international pride movement. A movement that can play its role together with the advocacy movement in advancing SOGIE rights for all. But increased awareness alone is not enough. Structural change is needed. InterPride is going through a major restructuring to ensure that the international role, that many expect from InterPride as international pride platform, can be played. Input from prides from Africa, South and Central America and Europe about what is needed has been provided. With the USA holding a dominant position within InterPride, the USA-prides positively opened the internal debate to give more space to the international voices within the global pride movement from elsewhere. Next to that, a first meeting took place last year between pride organizers from Asia in Tokyo. In Africa there are serious plans to establishing an African Pride Platform. 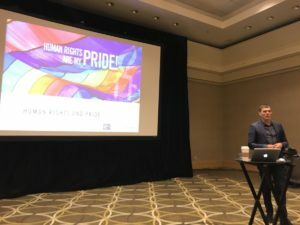 At InterPride’s World Conference in Indianapolis last year for the first time a delegation existing out of multiple prides from South America participated and the process to establish a South American Pride platform has started. We will also see the same developments in Central America soon. Furthermore, if all goes as planned, a Caribbean Pride Platform will be established by the end of this year. What has been lacking for so many years, structure within the international pride community, finally seems to get more traction. For prides around the world that are not connected to these developments, it is the right time to start considering involvement. The international pride movement in the end is build up out of prides, big and small, from around the globe impacting the lives of those in our own local communities and beyond.